sea | eat. drink. cook. travel. 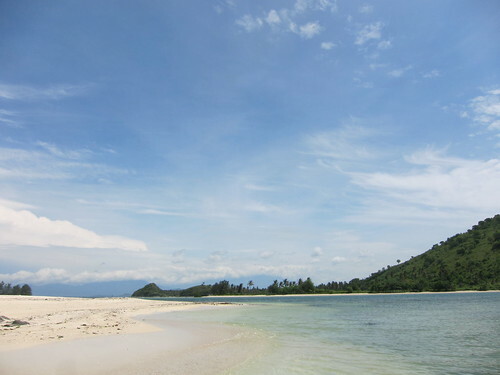 We finally got round to seeing the beach, going southeast to a different set of Gili islands from the usual Gili Air, Gili Meno, and Gili Trawangan. 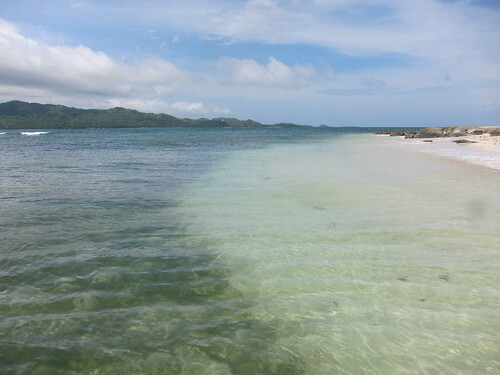 These Gilis were called Gili Nanggu and Gili Sudak. We drove about 2 hours down, following the winding road till we found the beach at Sekotong and rented a boat for the day. The boatmen took us in turn to each island, stopping first at the smallest one, a mere splodge of sand fringing the coast. It was a beautiful splodge of proper white sand, albeit rather coarse. 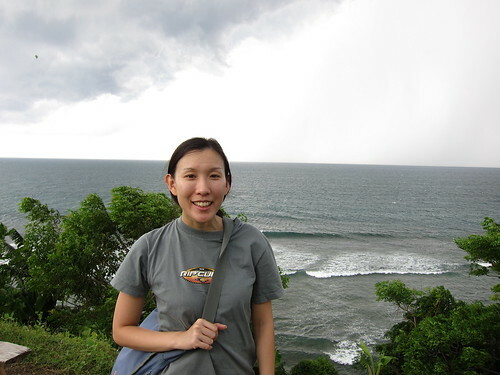 This was a far cry from the brown beaches of Senggigi – I didn’t even bother writing about that. We circled the island, found a nice spot and enjoyed the water for a bit. 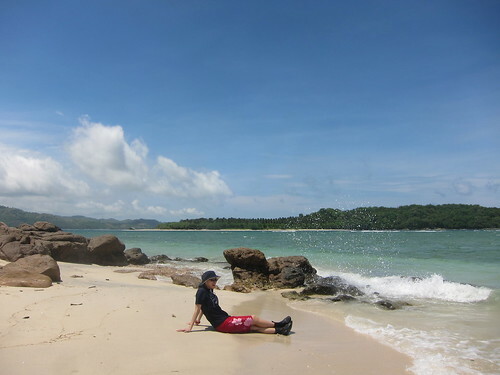 Then it was off to the next island, Gili Sudak, where we took a walk along the beach, thinking it wasn’t such a big islet. By the time we got round to the edge of the island, we realised that it might be bigger than we thought. For a moment, we wondered whether we’d starve by the time we got back to the little cafe for lunch. But it wasn’t too bad. After crossing round to the back of the island, there wasn’t a great deal more to go and we again sat and enjoyed the beach. 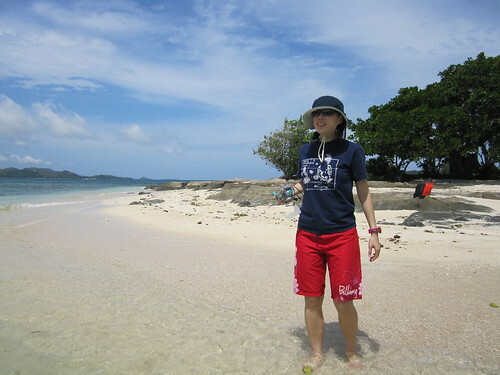 The waves were a little too strong for us to venture into the sea, so we saved that for the next island. We headed to our cafe for a simple lunch of nasi goreng and vegetable soup made with a chicken stock cube. 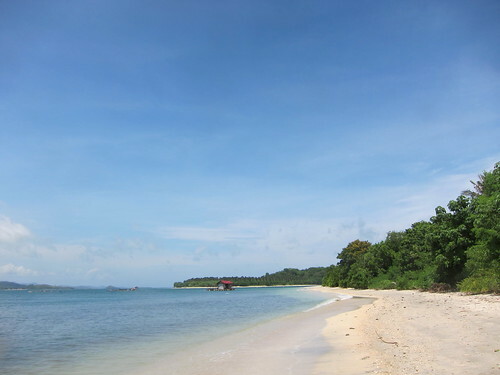 Then it was more lying around on Gili Nanggu. We wanted to go snorkelling, but the conditions weren’t good enough. Close to the beach, the waves churned up too much sand and further away, the waves seemed a little too aggressive. We ventured into the island and found a little turtle conservation area. There was lots of little pools of turtles of different ages. 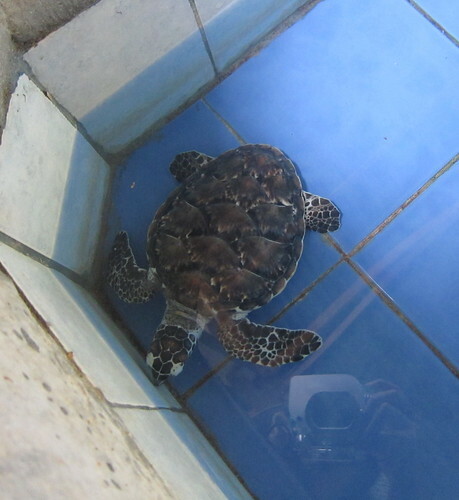 I think this little fella is a green turtle. We gawked for a while and then gave a little donation at the centre. 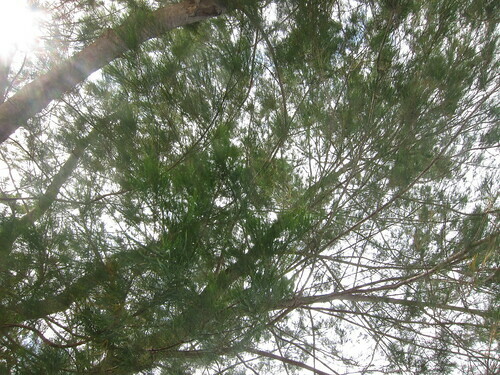 Then we lounged under some casuarina trees for a nap and headed back to Lombok. 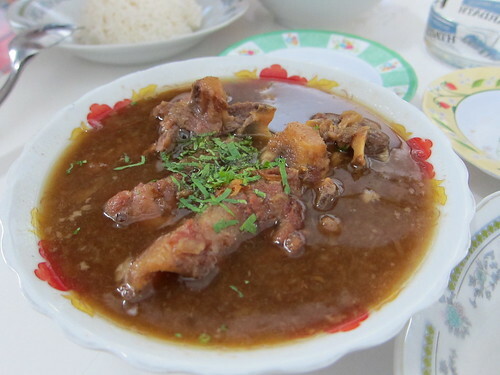 Our final meal in Lombok was this fantastic sop buntut, also known as oxtail soup. 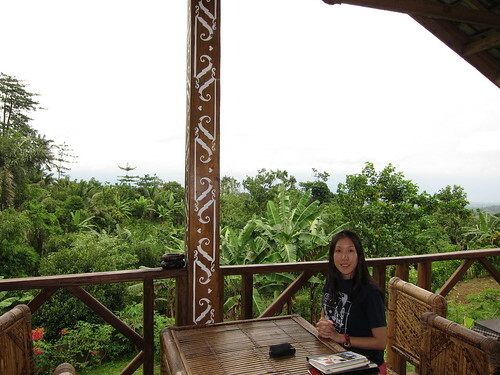 Again, Ibu Rosa at Villa Sayang recommended this place. It was sop buntut as I’ve never known before. The place was someone’s front sitting room converted into an eating house. It appeared that there was only one dish served here. Everyone had generous portions of tender oxtail in a thick, almost stew-like broth. They’d obviously spent ages gently cooking the oxtail as the soup was immensely flavourful and unctuous with collagen. The flavour was so intense that the were lime wedges provided to cut through the richness. I also liked the very spicy chilli sauce accompaniment – alternating mouthfuls of soup, chilli-spiced oxtail and plain rice was enough variety that I didn’t even think of having other dishes for our meal. They were very generous with the oxtail as well: plenty of soft meat that couldn’t help but be flavourful, and almost melted tendon. I think I’d return to Lombok just for this amazing dish. It was definitely the best sop buntut I’ve had. 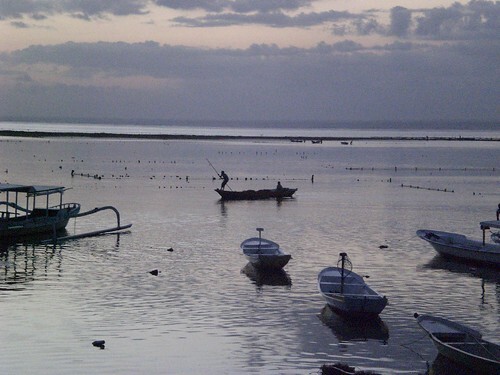 And with that marvellous meal, we ended our relaxing trip to Lombok. I think I enjoyed the eating far more than any other activity there! 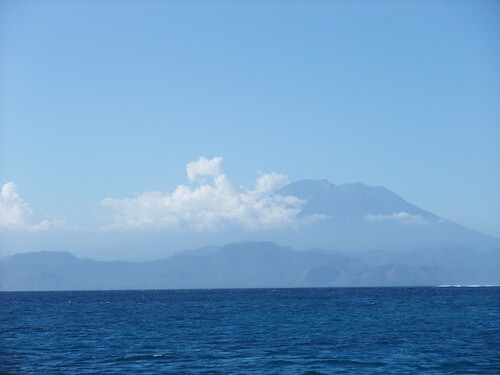 Lombok is famous for Mount Rinjani and a lot of people spend their entire trip climbing this mountain. I hear it’s not an easy ascent because the mountain is pretty high, a lot of people who ascend too fast end up with mountain sickness. We were wusses and did nothing more strenuous than drive the car up to the highest point we could. But let me start from the beginning. The road taking us to the mountain was winding and first sloped up one of the foothills, lending us a glimpse of the sea. It was partially hidden under the clouds and we were glad we hadn’t gone to the beach that day. As I said, the road was incredibly windy (in the winding sort of way, not the high winds sort of way). I’m glad DC drove and all I needed to do was navigate. 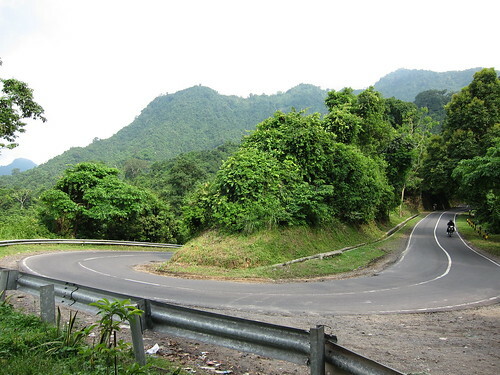 It was quite easy for most, because there wasn’t a huge choice of roads here! We stopped occasionally, most times to admire the view, this time apparently to admire the amount of dirt that started to cake the car already! The sky was all sorts of strange menacing, so we had to get off and snap a pic of me grinning maniacally with a backdrop of steel-grey sea and rolling clouds. 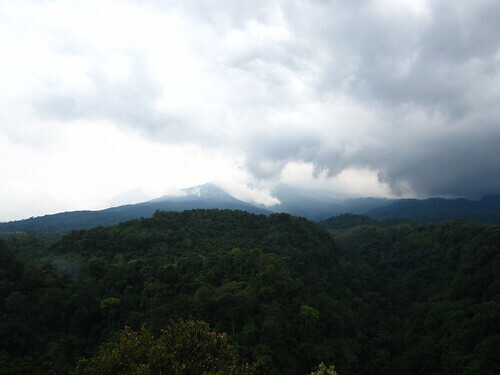 Then the approach to Rinjani. Here was where navigation was a bit tough as there were actually forks in the road. Sadly, I lost some of my navigation-fu and took us past our destination. Thankfully, there were plenty of friendly locals. 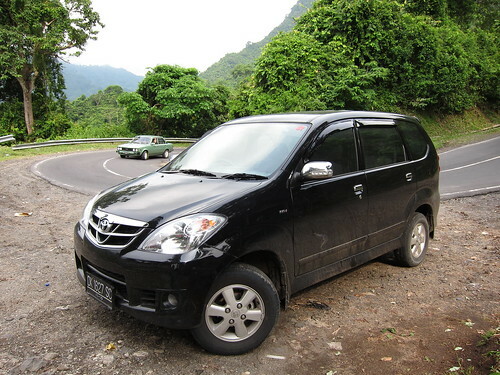 A rather dodgy pit stop at a local house later, we finally found our way on the road to Rinjani. We were a bit annoyed that the clouds almost completely obscured the peak. 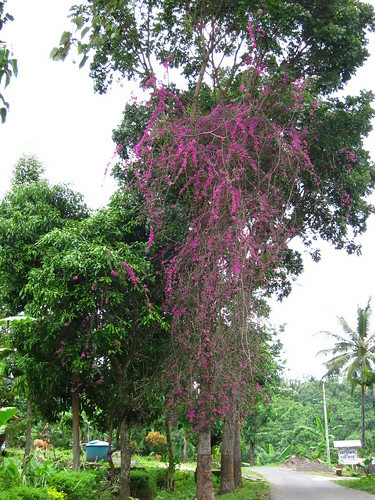 At least these bright pink flowers creeping on a tree added some vibrancy to our day. 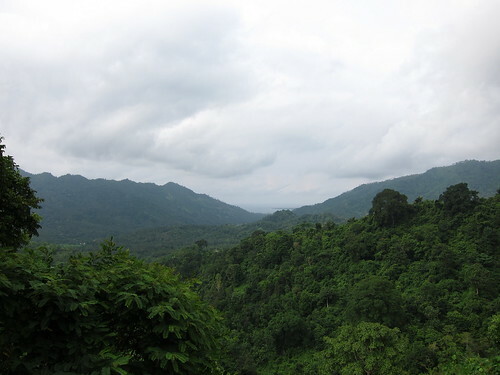 Still, it was lovely to soak in the cool weather and marvel that we were still on tropical Lombok. 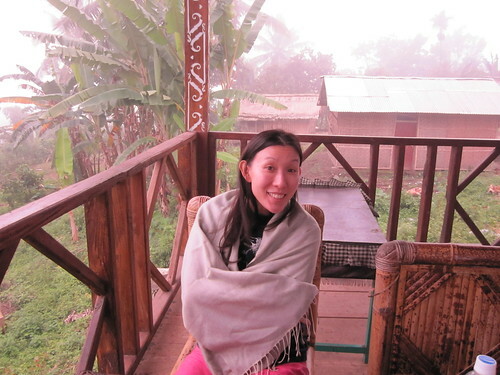 There were still plenty of banana trees downhill from the little cafe to remind us that we weren’t anywhere temperate. … and here you can see the mist roll right in. And then we drove back the way we came and spent the rest of the lazy day by the pool at Villa Sayang. I told you it was a relaxed holiday! 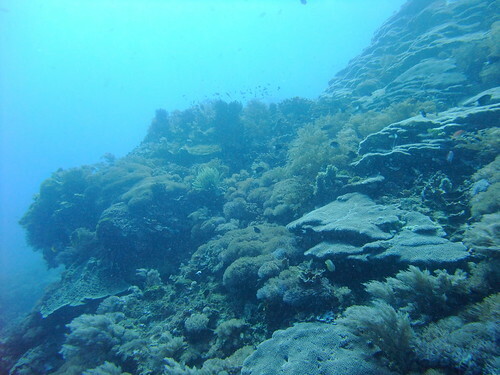 The other highlight of being in Permuteran was diving at Secret Bay. I don’t think it’s that big a secret anymore, but not as many divers go there. 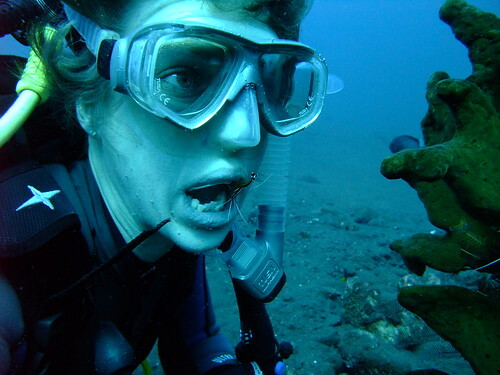 It’s a muck diving place, meaning that less of the casual divers and more of the serious divers go there. Why? 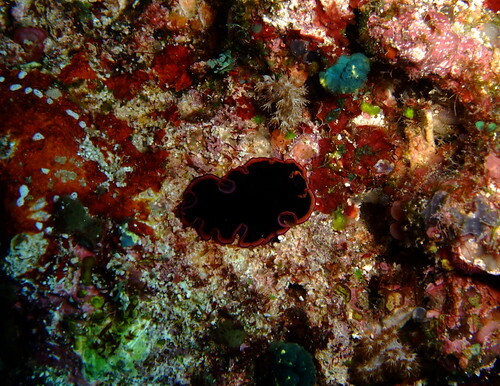 Because muck diving is all about diving in places with less than white sand and very little coral. The atmosphere can be very depressing because of the low light and poor visibility conditions. Nonetheless, there are plenty of weird and wonderful creatures to see. I strongly suspect this to be the Kodipungi lionfish, with its separated pectoral fin rays. It’s so beautiful and flamboyant against the dull grey sand. 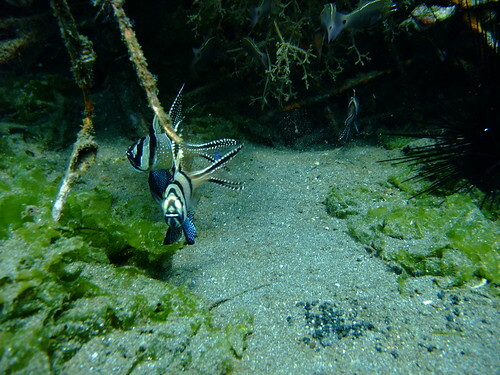 What surprised me next was the Banggai cardinalfish, something that is supposed to be very rare. 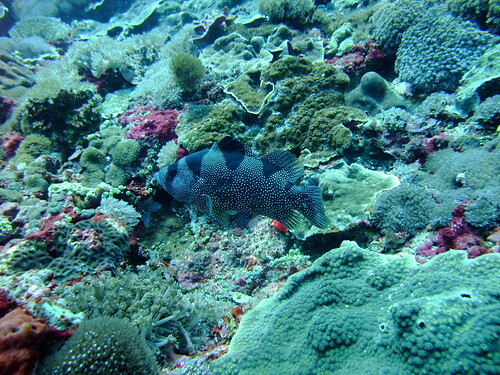 When I’d last dived in Manado, I was told that these fish were only found at Banggai Island and the Lembeh Strait. Balderdash! 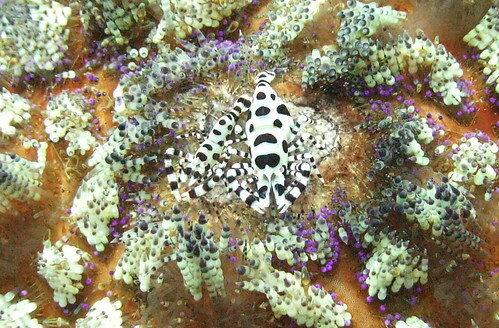 Their blue-black colouration with the almost fluorescent white spots was mesmerising. 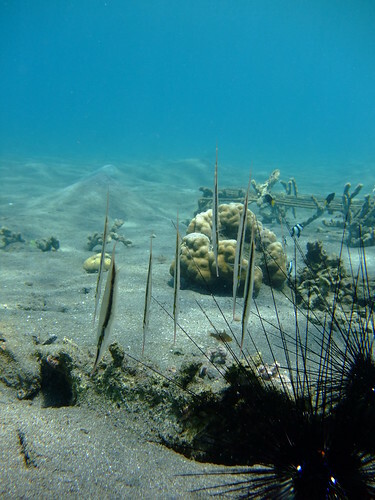 There were also plenty of razorfish among the sea urchins. 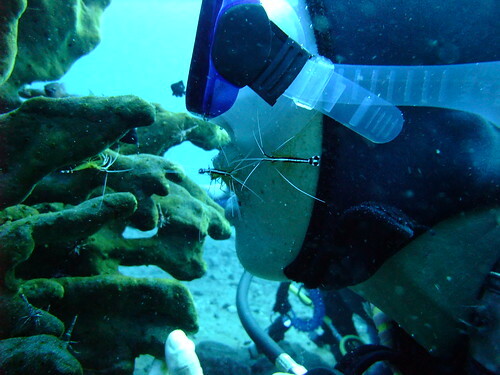 They were funny creatures that seemed to stand upside down on their noses to hunt for food. When pursued, they’d turn ninety degrees so they could make a quick getaway, but were otherwise always nose to the ground. 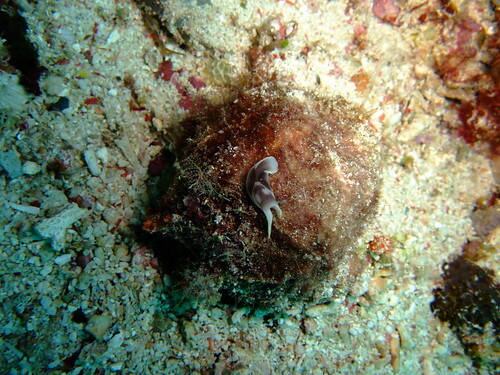 Another rare find was the hispid frogfish. It was hilarious how each had a disarmingly charming white pompom on its forehead. This pompom acted like a lure to bring in prey. In a gulp, the poor fish would be gone. Another odd fish was the cockatoo waspfish that liked to pretend to be a leaf swaying in the water. Very strange. 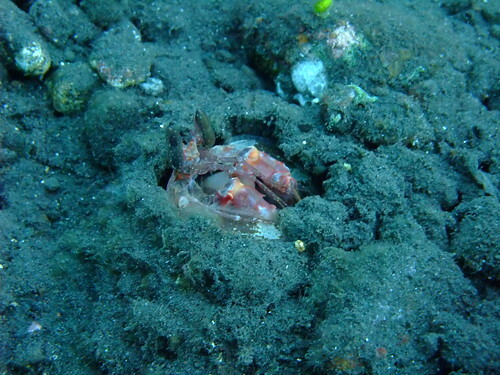 Less strange was this octopus that (for good reason) refused to budge from its hole. 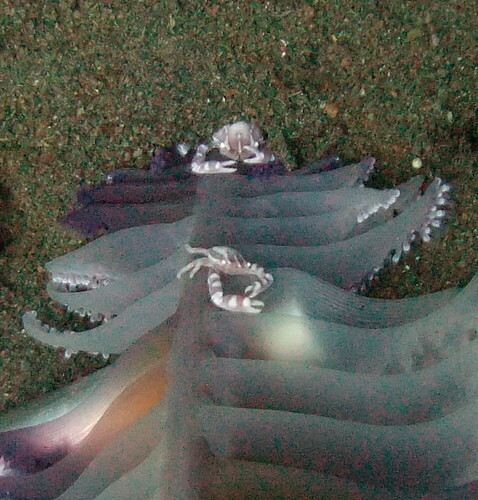 The best I could do was to take a blurred shot of its tentacles. Pity. 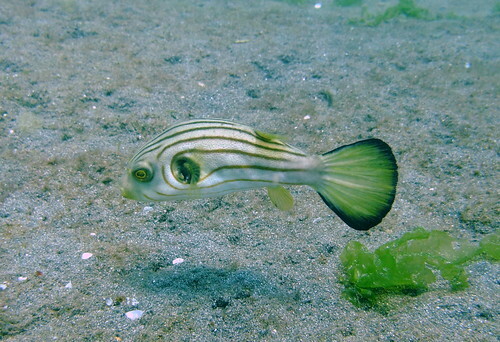 Other inhabitants of this freakish side show include the striped puffer with its dark blotch around the base of its pectoral fins making it look recessed and mutated. Reflecting the green seaweed was this unidentified goby. It would’ve been difficult to spot if it was just a few inches into the seaweed. 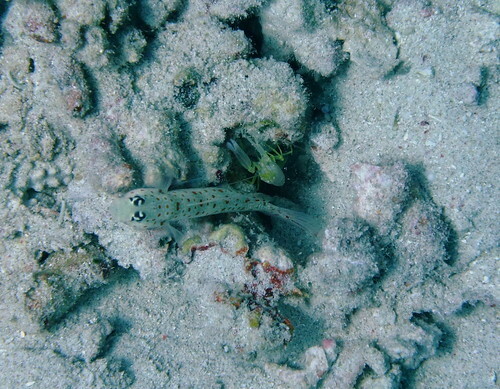 Easier to identify was the spotted shrimpgoby with its distinctive white iris and black markings. It was surprisingly how I managed to get close enough without startling the shrimpgoby. 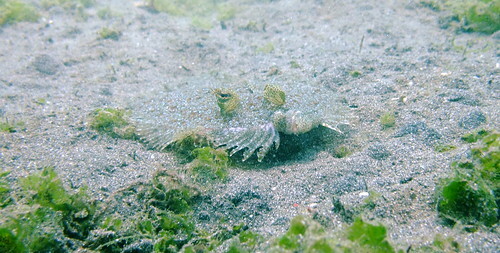 Almost completely camouflaged until it started moving was this peacock flounder with its weirdly asymmetrical eyes. 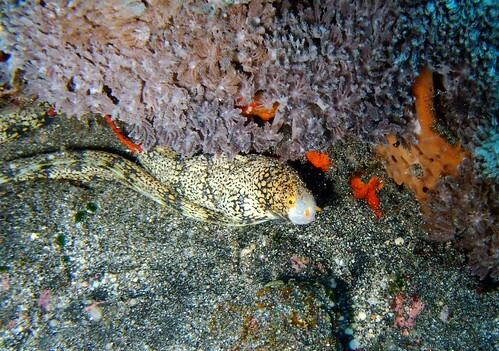 Another well-camouflaged fish was this orange and black dragonet, its only giveaway the orange lips. 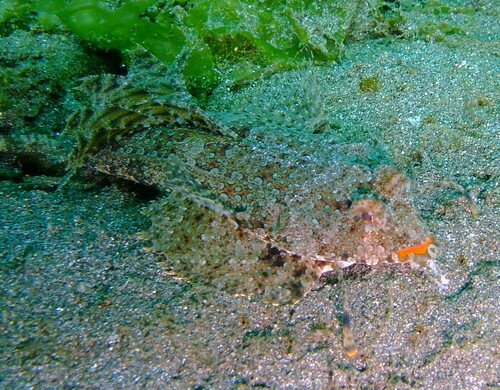 There were more – this crocodile flathead, if left alone, would soon change colour to blend in with the sand below. 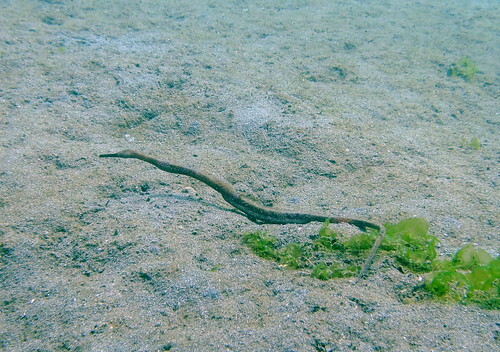 There was also this really ugly pipefish that looked like a piece of random trash in the water. No wonder it’s called muck diving. 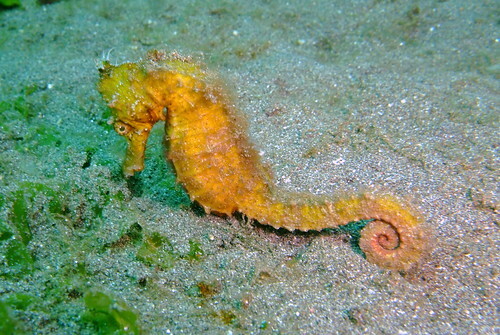 Secret Bay was one of the few places where I saw full-sized seahorses, like this thorny seahorse. I was so thrilled by this find! Even though we’re told that pygmy seahorses are very rare, somehow I feel that full-sized ones are even more so because guides tend not to look out for them. What a great find. 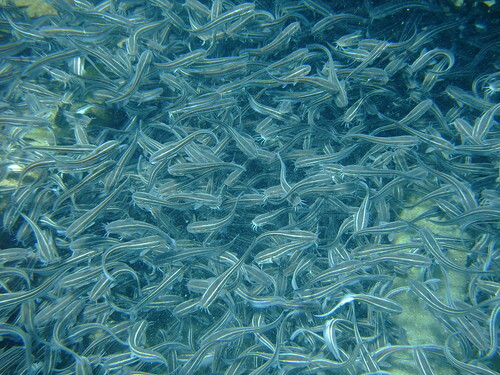 Another unexpected find was this whole pile of schooling catfish in the wreck of a little rowboat. 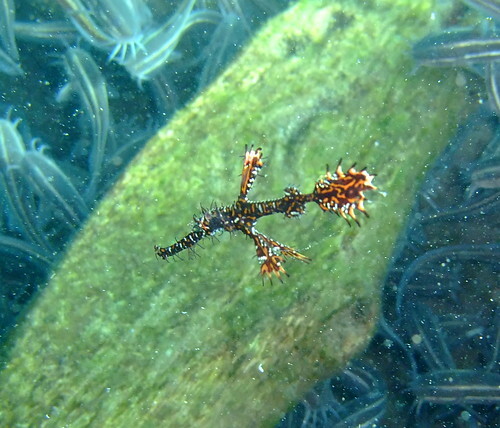 Even more surprising was this ornate ghost pipefish floating along obliviously above the seething mass of catfish. 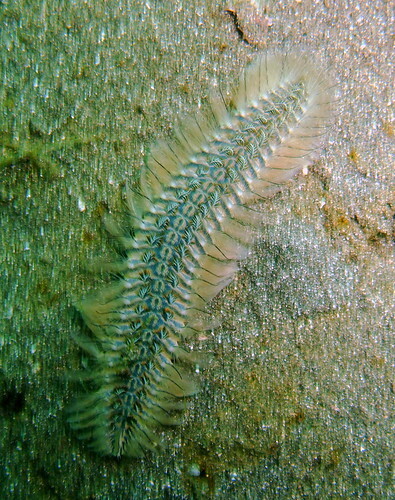 Other than that, there was a truly horrifying sea centipede, another first for me (and hopefully last). 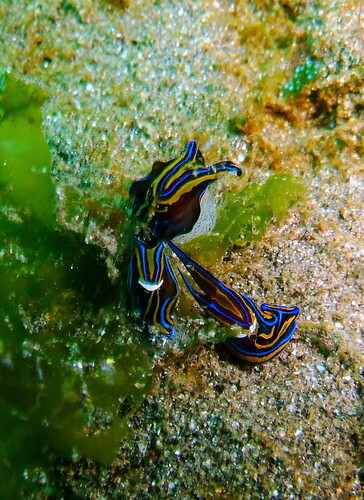 And then there were the ubiquitous nudibranchs, though this time nothing I’ve seen before again. Check out this scrum of beautiful blue and yellow ones too. Lovely huh. And rounding things off, here’s a video of something not seen that often – a white-eye moray eel out of its hole in search of prey. Enjoy. Komodo surprised me by throwing up plenty of critters. 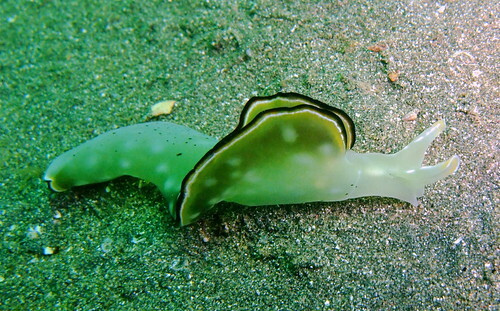 There were plenty of nudibranchs, as usual, eggs included. Some of them I still can’t identify though I see them occasionally. 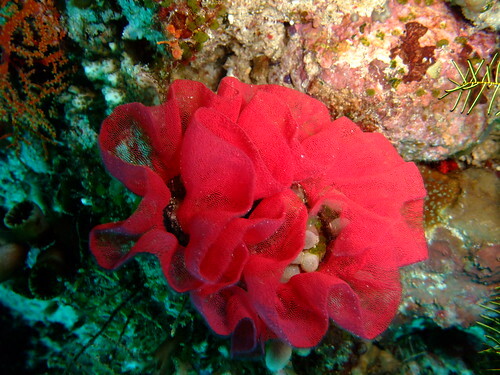 Others, I think I know the names, like this spanish dancer (I think). 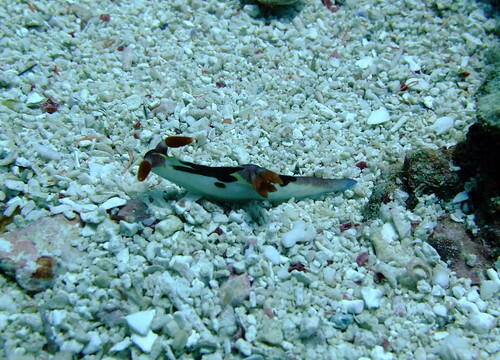 And then there are the ones that I’d seen for the first time in Komodo, and had no idea what they were. There were some that were plain bulbous and gross. If anything can tell me what this is, I’ll be quite grateful. I think this is more of a sea snail of sorts because I think our guides said something about the shell being on the inside and the soft stuff outside. There were also much prettier ones with delicate tendrils. 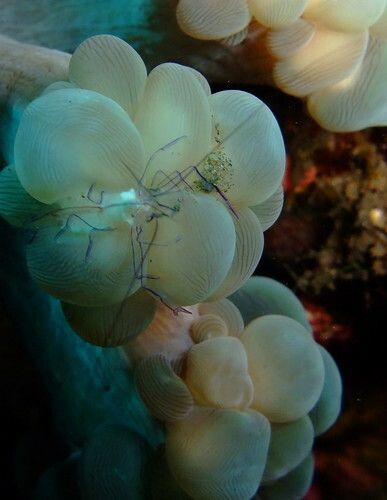 Then there were the crustaceans that lived in the delicate tendrils of corals, like this coral crab. 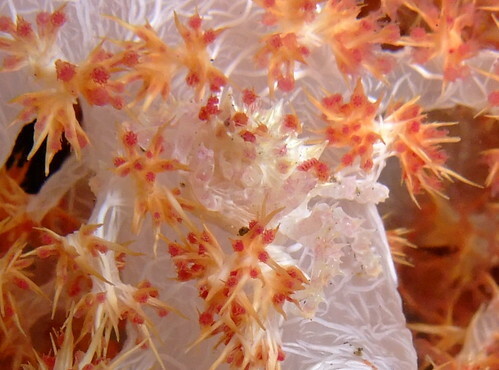 Others, like the orang utan crab, lived on cabbage coral. 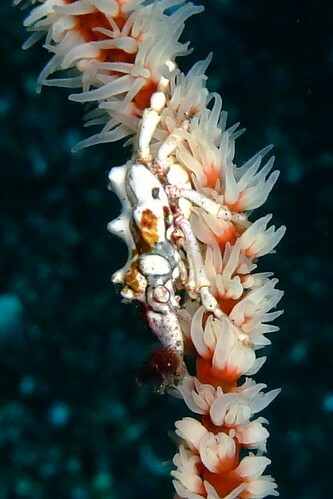 And there were the hard to find whip coral shrimp, which was a beast to photograph. I remember this little critter took me 10 minutes and a good 20 bar of air to get a not-great photo. And the highlight of the critters was Oscar the smashing mantis shrimp. This fella lived in a hole and whenever we’d visit, our guide would knock at the entrance of his hole. Before long, two little fish would rise out of the hole, smartly realising that the safest place would be in the cosy hole where Oscar couldn’t extend his smashing pincers. Check out how Oscar would come out and peer at the outside world. 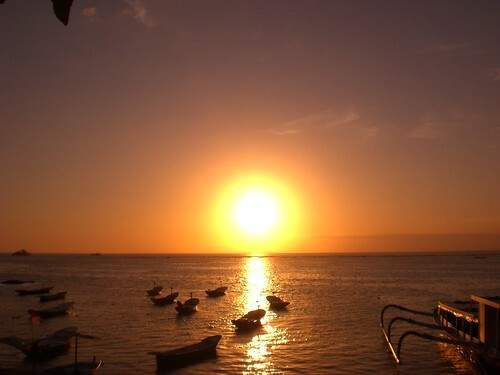 The diving at Nusa Lembongan and Nusa Penida was nothing short of beautiful. There was plenty of very healthy coral and every single dive was full of beautiful coral scapes, quite different from the black volcanic sands of Tulamben. 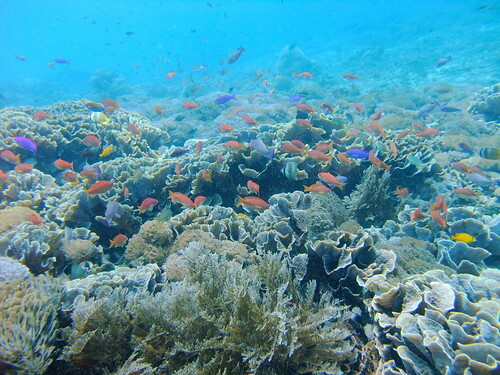 I loved how blue the water was and how colourful the fish were. 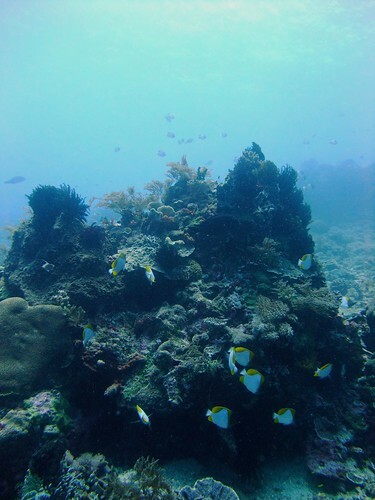 They were everywhere the eye could see, with the tiny brightly-hued anemonefish hovering on the roof, the slightly bigger ones like the butterflyfish close to the reef and the large ones like the trevally hunting a few metres from the reef. It wasn’t all blue underwater. 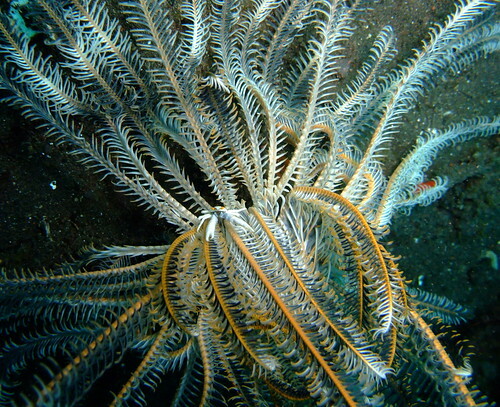 Featherstars like these gave bursts of colour along the way. 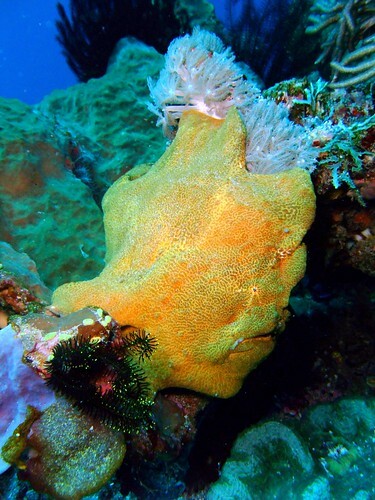 These creatures are relatives of the starfish and can walk themselves to convenient places to feed. 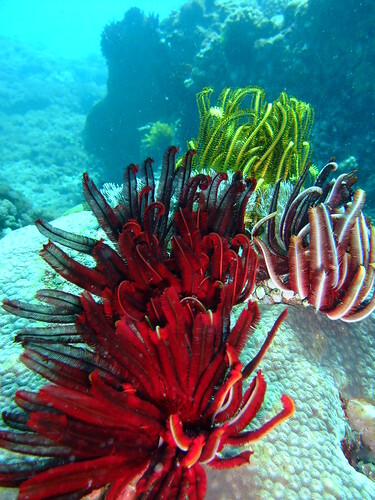 I like how they congregated on this coral to pose for a picture. 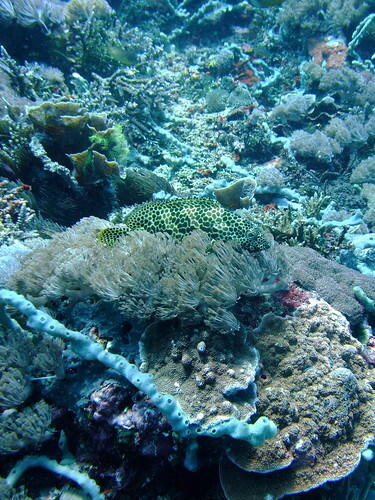 The fish closest to the reef are generally the smallest and naturally the most skittish because they are food for most other bigger fish. I had a hard time getting a picture of these two-tone dartfish that always come in pairs. I love how they look like they’re wearing frilly dark clown pants! 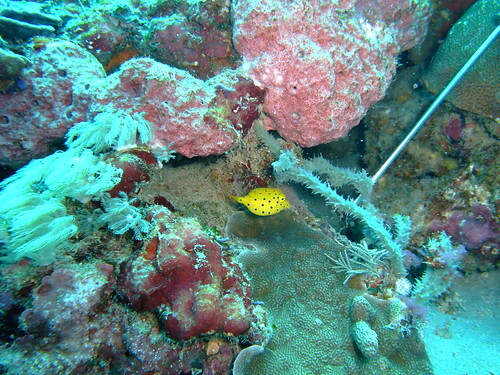 Another skittish fish was this adorable juvenile yellow boxfish that was almost impossible to catch on camera without being a spotted yellow blur. 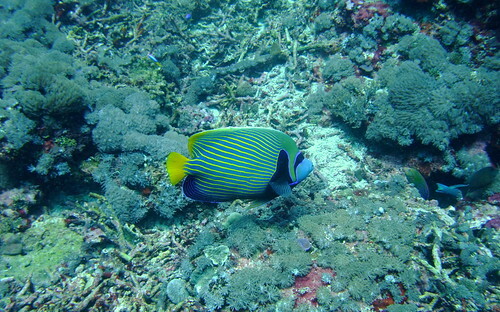 Bigger and less shy, yet still hard to capture was the emperor angelfish. It had this knack of sailing off in a huffy imperial manner away from the camera. 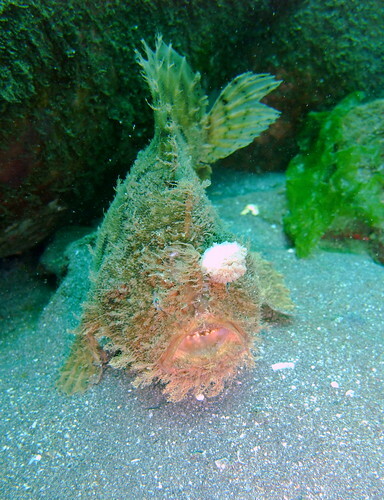 Also adopting a regal manner was the spotted soapfish. Again, I kept capturing the tails of these fellas till this one though no doubt it’s angled away in retreat. 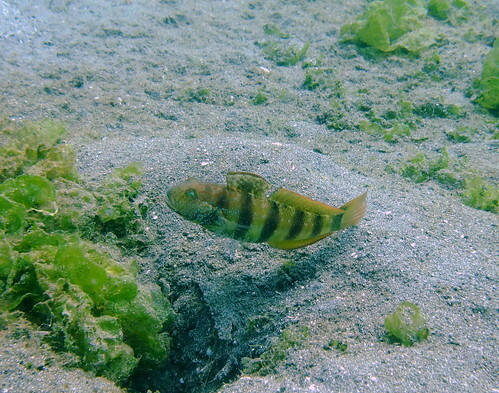 Less skittish fish are those that laze along the bottom of the reef, like this hexagon grouper. 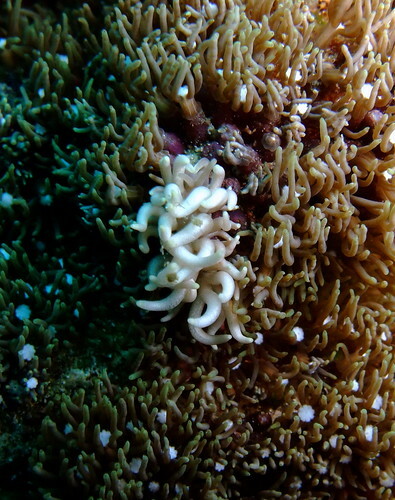 It perched itself on the coral and anemones, keeping a careful eye on nearby divers and moving away on if they got too close for comfort. 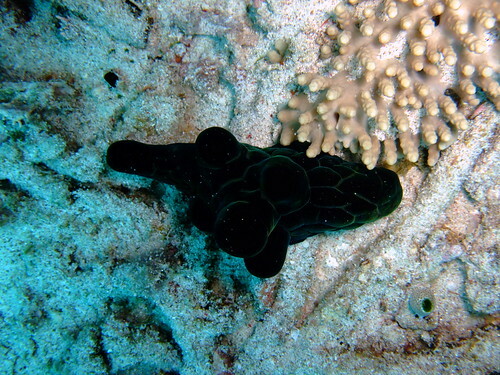 Others didn’t bat an eyelid even when we got close for a shot, like this giant frogfish. 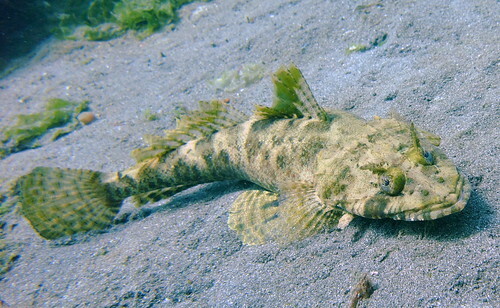 All it did was occasionally shift its foot-like ventral fins to get to a more comfortable position. 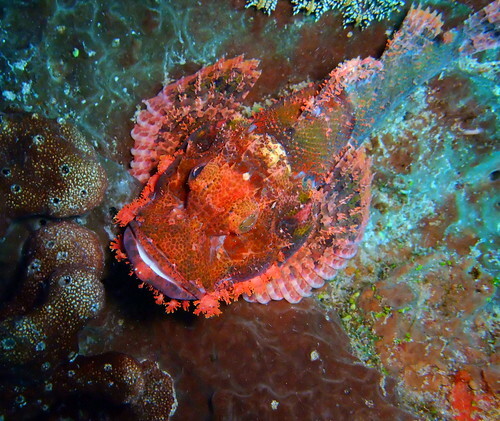 One fish that we daren’t get too close too was the scorpionfish. 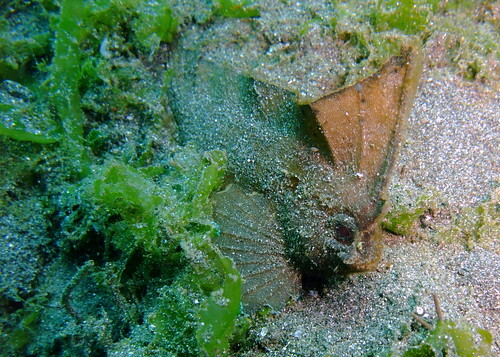 This specimen is probably either a tasseled or Poss’s scorpionfish, with its well developed skin tassels along its chin and jaw. 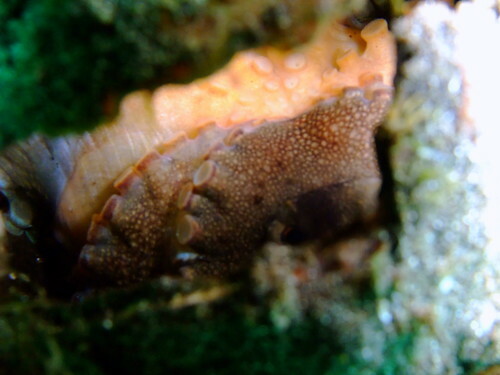 Other things hardly moved at all, like this egg cowrie. 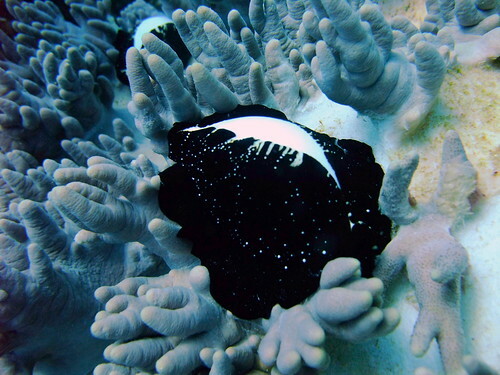 Its black mantle covered most its smooth white shell whilst it fed on soft coral. Some creatures were actively out hunting, like this very cute snowflake moray eel. It had a most sheepish expression on its face that amused me to no end. 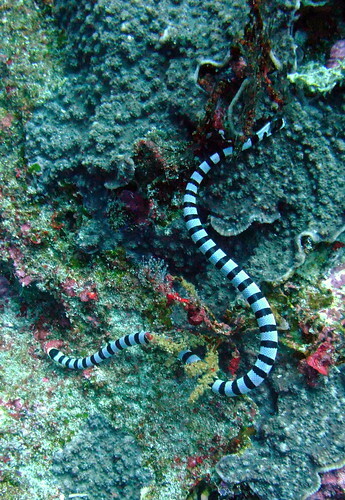 There was also the banded sea snake, a highly venomous reptile that we steered clear off. From a distance, I admired its pretty bands of alternating black and pale blue, its smooth rounded head and its rudder-like tail that was well adapted to propelling itself in search of prey. 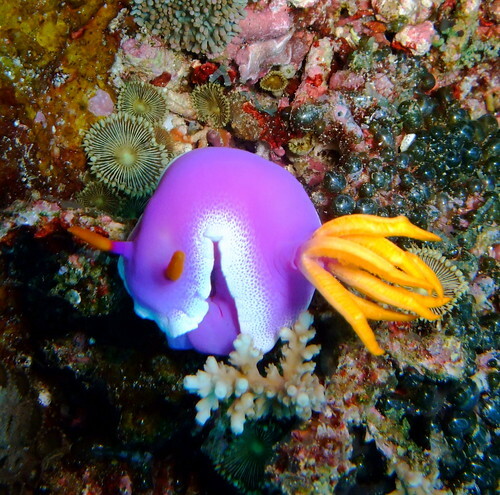 Last of all was this pretty pink nudibranch with an orange flower on its back. 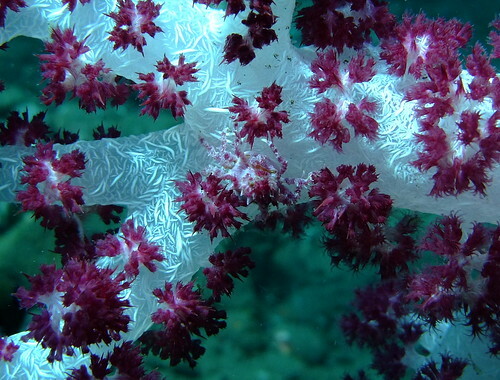 It’s actually a pink dorid and the flower is its branchial plume through which it breathes. I wonder why it was doubled over though. 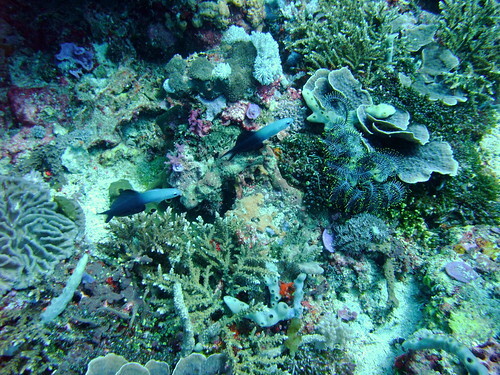 Even without the fish I was after, seeing the variety of life here was rewarding in its own right. More to come in my next post! 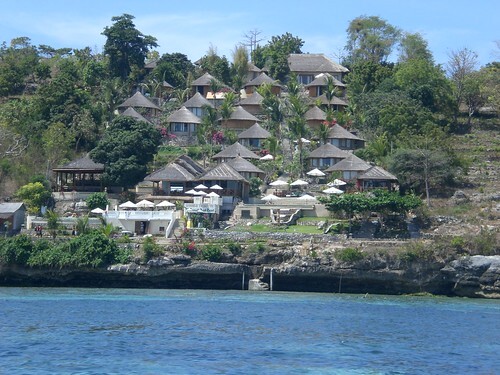 Just off the southeast of Bali is a little island called Nusa Penida and off Nusa Penida is the even littler island of Nusa Lembongan. This littler island was my next stop. 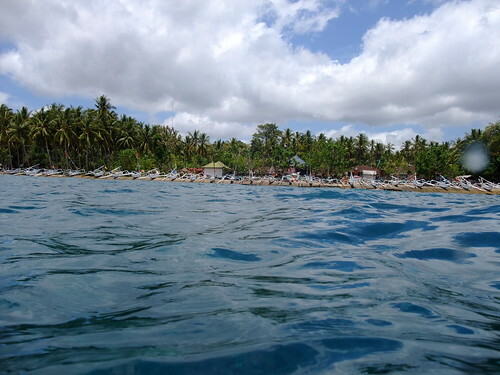 It was an idyllic little place blessed with lots of sunshine and blue, blue sea while I was there. 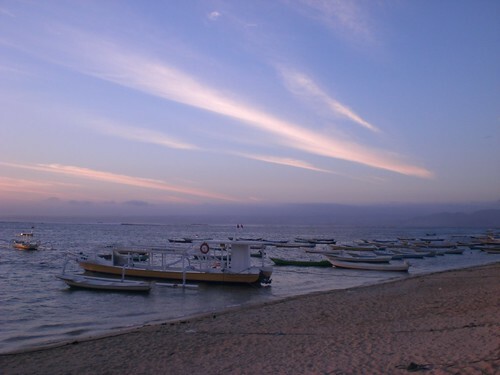 Every morning we’d go out diving and the water was always clear and blue, as was invariably the sky. 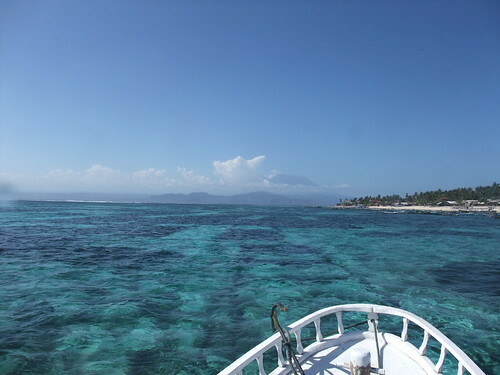 We dived mainly along the sheltered west-facing side of Nusa Penida, which meant that most times upon surfacing, the majestic Gunung Agung rose from the horizon. 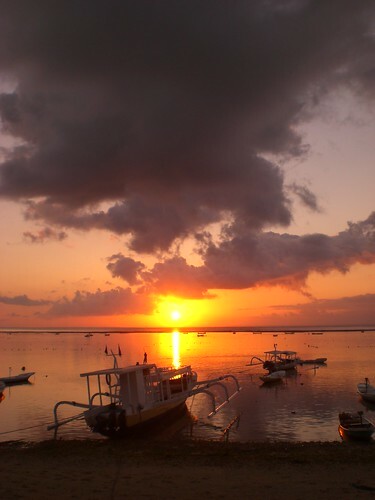 It was lovely to see this familiar site accompany me on my Bali sojourn. Sometimes on coming back from diving, we passed surfers catching the waves. I made friends with an Australian couple there. The wife dived most days while the husband surfed. 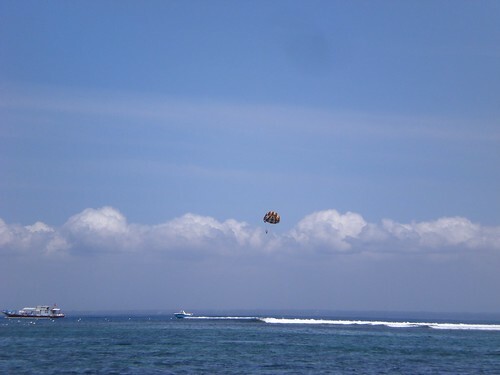 It was very relaxed diving compared to Tulamben. We did two dives a day compared to the hectic four previously. It gave me time to chill out on the beach, watching the occasional parasurfer go by. There were lots of pretty villas along the main stretch, hugging the hill round its curves. I stayed at Pondok Baruna, almost at the far end. 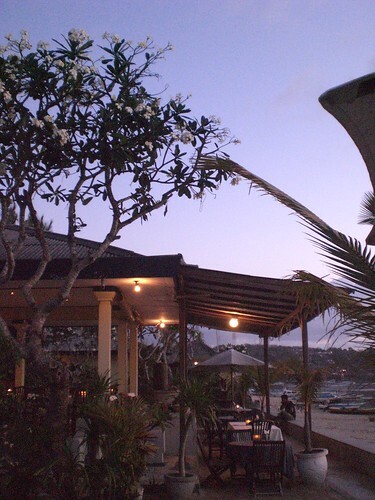 It set in a beautiful traditional Balinese garden, a perfect place to unwind after a hard day’s dive. 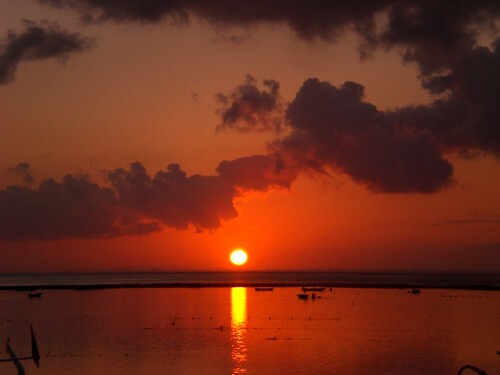 … and the sun starting to send streaks of orange-pink across the sky. … and finally extinguished itself in the water. You may have noticed that I didn’t have anything about crustaceans in my last post. This one is dedicated purely to the group of incredibly diverse and fascinating creatures. Tulamben is home to many crustaceans that, a hundred dives on, I still haven’t seen in such abundance, and in some cases never again since. 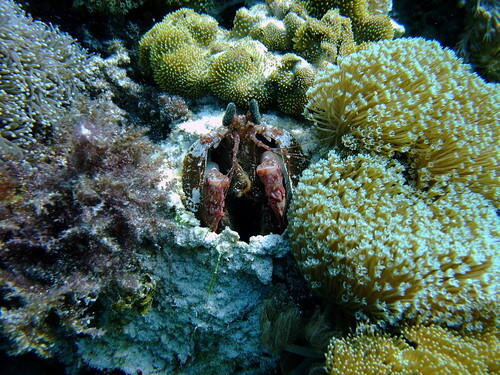 Case in point is the soft coral crab below. 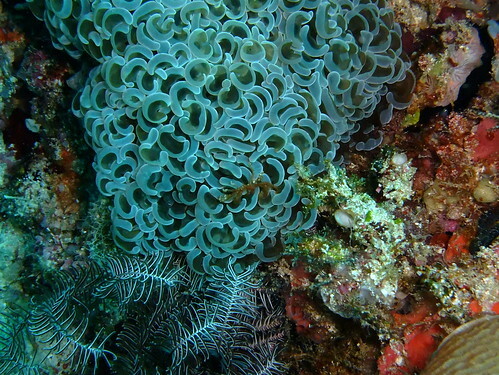 It’s amazing how it just blends in with the coral. Look carefully at the centre of the photo and you’ll see it. Again, it was thanks to Wayan’s amazing eyesight that I managed to capture these shots. 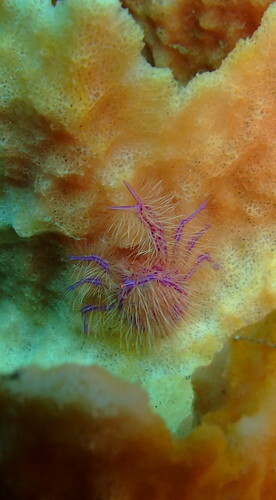 Then there was the delicate hairy purple crab that lived on barrel sponges. 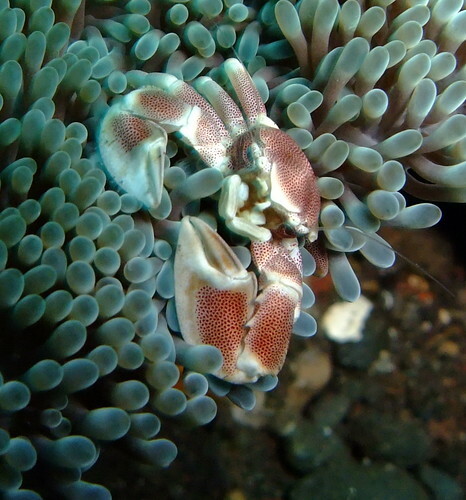 And there was the typical porcelain anemone crab that showed up fearlessly in broad daylight. 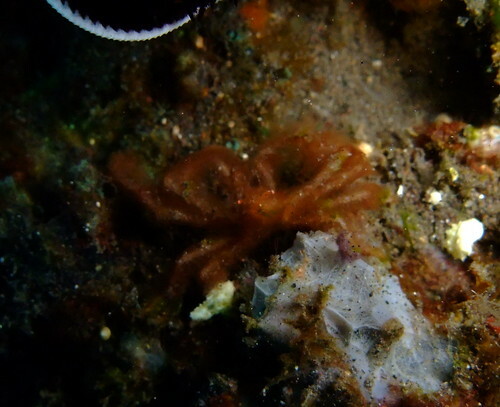 Harder to spot was yet another weird species of crab, the wispy looking orange utan crab. 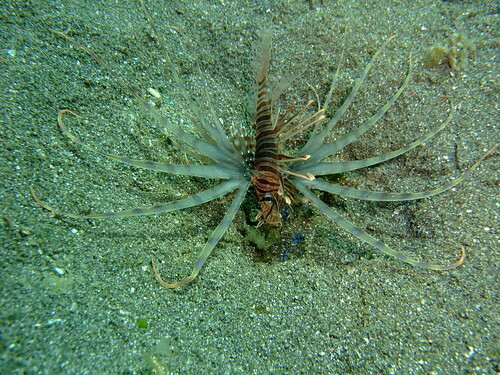 Then there were the lobsters, like this one living on feather stars. And yet more living on sea pens, like these squat lobsters. And there was this tiny bizarre-looking lobster that lived on sea whips. Next on the list were the mantis shrimps. The larger ones were the smashing mantis shrimps that carried sudden attacks to catch unsuspecting fish that passed by its hole. 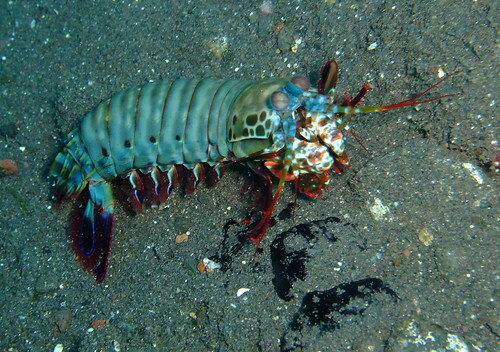 Prettier was the peacock mantis shrimp that came out to hunt in its full regalia of colourful armour. 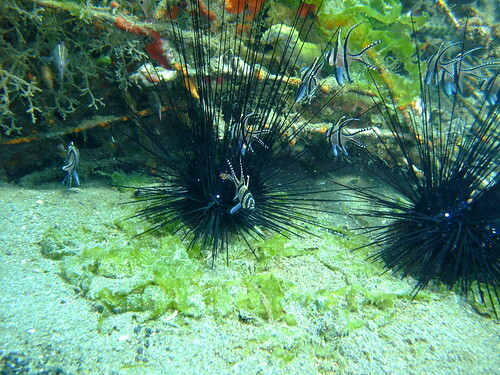 In the shrimp family were Coleman shrimp that sat pretty on thorny sea urchins. 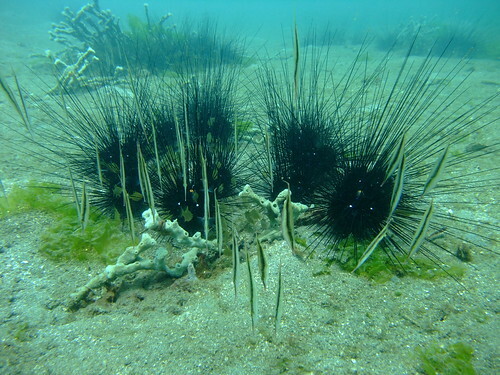 They made space for themselves by snipping off bits of sea urchin spines, forming a clearing of sorts for their home. 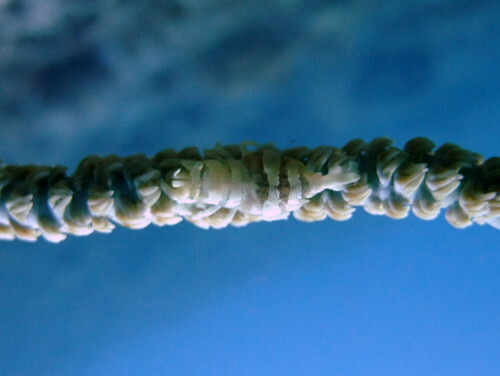 There were little shrimp that lived on bubble coral. 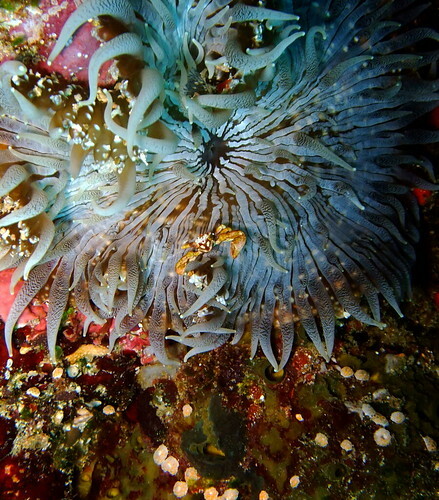 And others that lived on anemones. There were also plenty of cleaner shrimp. Put your hand close enough and they’ll clean your fingernails for you. Put your mouth close enough and they’ll clean your teeth for you. Here’s Wayan demonstrating. And here’s one of my dive buddies showing off the new trick too. Cool eh.